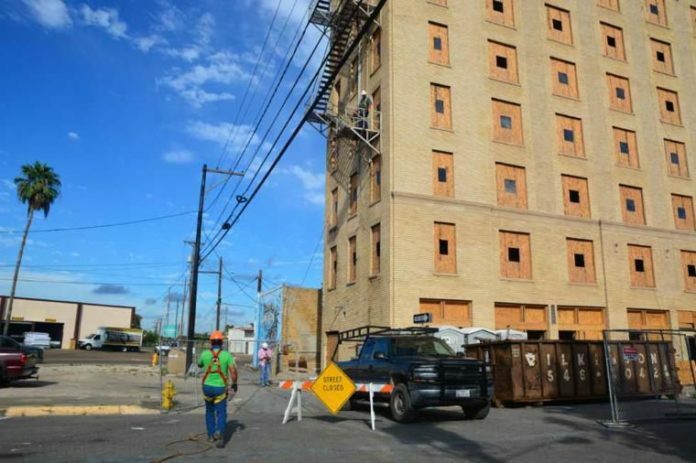 The fire escapes on the Baxter Building in Harlingen are being taken down. HARLINGEN — The original plan was to keep it as a historical memento, but time, weather and exposure combined to doom the iconic fire escape on the Baxter Building’s south side. The metal stairs affixed to the brickwork on the building have rusted out, and some of the rungs on the staircase have even come loose. “This fire escape would have had to have been cleaned up, primed and repainted to leave it in place, and it was just rusted down,” Rodger Lewis, construction site supervisor, said yesterday. “If you look at the fire escape itself, we sure don’t want anybody to get on the fire escape and cause them to get hurt. You see the treads on that landing? Or on the stairway going up? They’re damaged. It’s not in good shape. “ It’s a safety issue, it’s a restoration issue, it’s a historical issue,” he added. The $4.5 million renovation of the city’s most iconic piece of architecture continues. Built in 1927, the nine-story structure at the corner of A Street and Jackson Street is being converted into 24 largely low-income housing units. The building is a representative example of what is known as the “Medical Arts Building” era of American architecture. Similar buildings, or at least those still standing, have been renovated in cities across the South and the Midwest. Lewis said yesterday at the Baxter job site his crew would remove the top half of the fire escape today once power lines have been moved a few feet away from the building to meet legal distance requirements to safely bring down the escape. Then the crew will affix a block-and-tackle to the roof and lower the fire escape to the ground. “We think that’s the easiest way to do it, and the safest way,” Lewis said. “It’s less inconvenience. You can think about a crane sitting out here … we’d block traffic, we’d block the alley and it would be a mess for the downtown businesses. Renovation work on the Baxter Building began this summer and the owners hope to have the job completed in eight months. Developers MRE Capital, based in Kansas City, Missouri, were awarded $3.3 million in state tax credits over a decade as part of its plan to restore the Baxter Building close to its original condition. The developer will turn the building into 24 apartments, of which 19 will be low-income units. MRE has finished or is currently involved in similar renovation projects in Kansas, Oklahoma, Arkansas, Missouri, Alabama and Texas. Several of these properties are remarkably similar in appearance to the Baxter Building — older, urban high-rises of six, eight and 11 stories. MRE has already finished renovating around a dozen mostly historic hotels, using a similar tax credit strategy to ensure the survival of historic buildings in cities like Pratt, Kansas, Claremore, Oklahoma, Cisco, Texas, and Plainview, Texas. It isn’t known what the apartments in the Baxter Building will rent for, but developers previously have said their pricing will reflect the city’s market rate.